Tweetbot is the app I’ve been waiting for: an excellent innovator of the Twitter platform. My new favorite Twitter client. Tweetbot is everything I’ve ever wanted from a Twitter app: it looks great, it’s fast on WiFi and 3G, it innovates in several aspects that have been regarded as “standards” from both users and developers for too long. Could Tweetbot be any better? Maybe. The developers could work on improving the speed of animations and refresh times as much as possible, or implement support for Readability and other URL shortening services. But as far as the Twitter experience goes, Tweetbot has got everything I’m looking for. I have tried many Twitter apps in the past years, as you may know, and I’ve never seen a third-party developer as committed to making their client great as Tapbots did with Tweetbot for iPhone. Iteration. Tapbots listened to feedback, and managed to pull the old trick of implementing features without turning your original vision into a piece a software it wasn’t meant to be. With version 2.0 of Tweetbot for iPhone, Tapbots has improved almost every aspect of the original experience, adding features, bug fixes, and refinements that still make Tweetbot the finest Twitter client available on the iPhone. Now faster, smoother, and more intuitive. 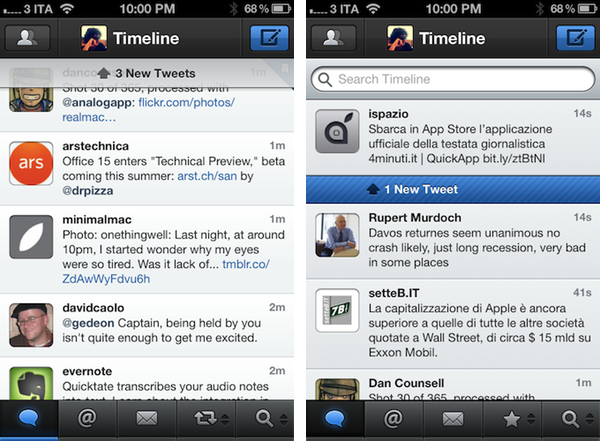 Tweetbot 1.1 brings landscape mode. Tweetbot 1.2 is released with several enhancements all around the app. Tweetbot 1.3 has new features including Favstar support. Push notifications are added natively to Tweetbot, and they are fantastic. Tweetbot 1.5 gets muting features. 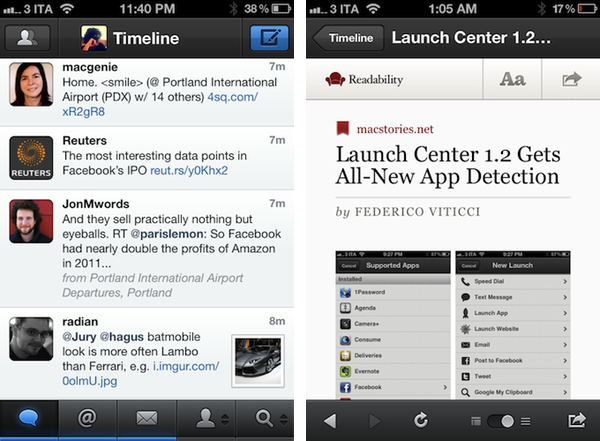 Tweetbot 1.6 syncs with other Twitter clients using Tweet Marker. Tweetbot is one of the first clients to get native Twitter integration in iOS 5. As you can see, Tapbots didn’t rest on its laurels, deciding to keep on building on the app's momentum to deliver the Twitter client that could appeal to both power users and less tech-savvy citizens of the Twitterverse. I have already explained why Tweetbot is my Twitter client of choice: if anything, I’d like Tweetbot to take over the entire ecosystem to offer an integrated experience consistent across platforms. It would be easy to look at Tweetbot 2.0 and say it’s everything Tweetbot 1.0 should have been without considering the various milestones and updates that brought us to this release. Think of Tweetbot 2.0 as a natural evolution of Tweetbot, rather than just a collection of features that didn’t make it in version 1.0. Tweetbot 2.0 is the culmination of nine months of fine-tuning. 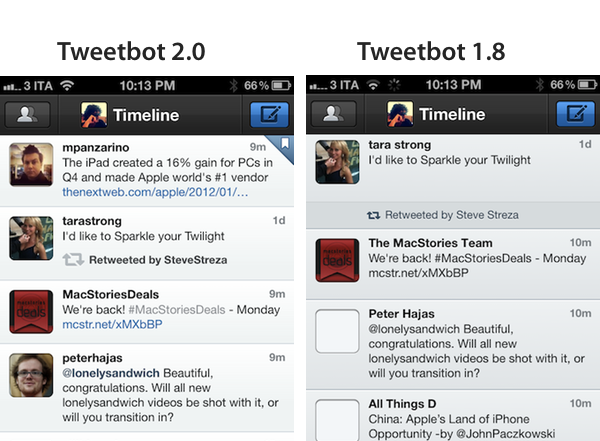 The biggest change in Tweetbot 2.0 is the timeline. What used to require two taps now needs only one, and the way retweets are displayed has been improved to increase interaction and overall navigation between original posters and retweeters. In Tweetbot 1.x, opening a @username or http:// link from a tweet in the timeline required a double-tap (or an initial tap to “expand” the tweet and reveal the tweet drawer), then a second one to tap on usernames and links. In Tweetbot 2.0, you can directly single-tap on links and usernames (which are a bit bolder than other words) without opening the drawer; you can always reveal more options by tapping somewhere else on the tweet, but this time single taps on usernames and links will open a user’s profile view or a web view, respectively. Similarly, single-tapping on profile pics in the timeline will take you to the profile view, whereas in Tweetbot 1.x this action would open the tweet drawer. Without sacrificing performances in any way (actually, Tweetbot 2.0 with its new tap actions and timeline UI feels faster than Tweetbot 1.x on my iPhone 4S – both in terms of scrolling, swiping, and image caching), Tweetbot’s improved tap behavior is more than a welcome change – it’s a terrific improvement over the previous version’s navigation system. Links and usernames aren’t the only things you can now tap on – retweets, displayed natively in Tweetbot, have been redesigned to allow users to tap and tap & hold on the name of the user that retweeted a status update; furthermore, the entire retweet UI has been tweaked to integrate the “Retweeted by …” indicator inside the message cell – take a look the screenshot below for comparison. If the people you follow often retweet stuff, this is another great improvement as it enables you to easily check the user who retweeted something you like. As you scroll Tweetbot’s new timeline, you’ll notice that another addition has found its way in this update: image thumbnails. How many times have you looked at Instagram links (or any picture link) and wondered if it’d be appropriate to open it, or if you’d be interested in it? Fear no more, as Tweetbot now displays thumbnails inline and allows you to tap on them to jump straight to the image viewer in full-screen. The image viewer itself is the same of Tweetbot 1.0; by tapping & holding the thumbnail, however, you’re given some handy options such as Send to Instapaper (which becomes Pinboard or Read It Later depending on the service you’ve configured in Settings), Tweet URL, Open in Safari, Copy URL, and Email URL. Even with thumbnails, scrolling in Tweetbot’s new timeline is smooth and fast. But there’s more. Remember the “new tweets bar” from the original Tweetbot, the blue stripe that let you know how many new tweets you had in your timeline and loaded differently depending on gap behavior? It’s gone. Instead, Tweetbot 2.0 features a new beautiful translucent tweets bar that works the same for gap loading (admittedly, still the best implementation on any iOS Twitter client) but that you can also hide on scroll or make persistent as you swipe down to reach the top of your timeline. Why is the new tweets bar useful? It provides a nice-looking and unobtrusive way of knowing how many tweets you still have to read – at least for me, this is very useful when I’m opening Twitter after hours of inactivity. And then there are a lot of little changes and minor fixes. Overall performance, as I said, has been improved, making Tweetbot faster than ever and smoother in any kind of animation. Perhaps this will convince those who said Tweetbot was “heavy” that it’s worth trying the app again. Even when the new tweets bar isn’t hidden, you can tap on it to dismiss it. You can tap & hold on the gear icon in the tweet drawer to reveal two extra actions: Post Link to Tweet and View in Favstar, with Copy Link to Tweet now assigned to a single tap on the gear icon. Links in users’ profiles are tappable and the visual Tweet Marker indicator is now always visible regardless of whether you’ve activated the service or not (obviously, you’ll have to turn it on to sync to other clients). I can go on with changes and enhancements. Direct Messages have been completely redesigned to load faster and have conversations displayed from top to bottom as in Messages.app. To reply to a DM in a conversation, Tapbots has brought a Messages-like text entry field to the DM view, which now also happens to refresh every 5 minutes as part of the timed auto-refresh feature that also works for Timeline and Mentions. In Tweetbot 2.0, when a DM fails the app will make it red, allowing you to tap on it to resend or delete. Readability has been added as a mobilizer service, and there is now a toggle in every web view to instantly switch between full site and mobilized view. I love this feature (but I use Instapaper for that). Oh, and one more thing: don't forget Tweetbot supports a variety of URL schemes, more than you know, and they work very well with Launch Center. Tweetbot 1.0 was packed with features, proving that Tapbots could make their distinctive style work in the saturated market of Twitter clients. Updates to Tweetbot 1.0 built on the original vision, adding new powerful features and interactions that allowed Tapbots to reach an even larger audience, especially since the addition of native push notifications. Tweetbot 2.0 accomplishes the difficult goal of dramatically enhancing Tweetbot 1.0 while keeping everything familiar and accessible, proving that Tapbots can still make the best Twitter client around. Tweetbot 2.0 is now available on the App Store at $2.99.